And based upon these results we make some recommendation/conclusion and work on the negative points to grow our business. But this is not as simple as this sounds too. Most of us simply use Google Analytics free version to track our visitors and to find which page they are visiting and through which keywords they are coming. But due to the high competition, we can’t be ahead of others if we are just using the basic analysis. So, today I am going to share one of the top analytics tool Lucky Orange which is capable of giving you whatever you want to know about visitors and their actions. This is a perfect tool for all your analytics need. Lucky Orange is an analytics platform that offers not just your typical users stats but many more than the traditional analytics. This is just a perfect alternative of Google Analytics. So if you are fed up with Google Analytics or want a change, do try Lucky Orange. They so you exactly how people are browsing your website. You can play with individual user’s session and data and can find the gaps between what users are expecting and what you are providing and finally filling the gap between the so called demand and supply. Lucky Orange has 7 amazing applications using which you can have complete insight of your analytics. Let me take you through each one of those application one by one. I think from these data you would be able to reach to the conclusion that what are your week and strong areas and can work on week. I have seen many online companies those are using many companies services for their online need like Analytics from X company, Pool from Y, chat from Z and so on… and managing all become tedious job. So here is the solution for it. Lucky Orange provides chat feature as well. This feature gives you the option to interact with your users in real time and if they are facing any issue, you can resolve those immediately and so proving great support which now a days is utmost important. The best thing is, it works smoothly with on all the devices like phone, laptop, tablet etc. This is the feature that I liked most. 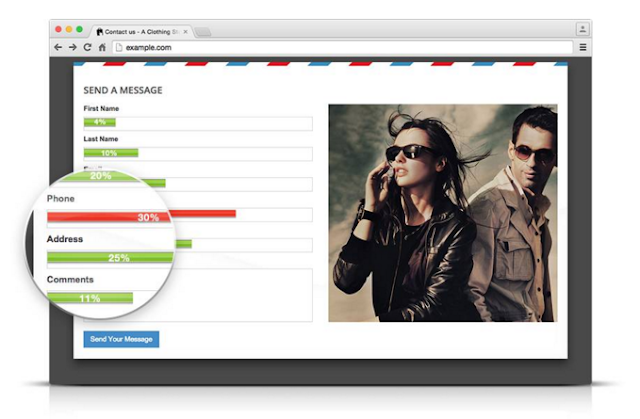 Lucky Orange will automatically create a recording of every visitor to your website. Quickly filter and segment recordings so you can see exactly why visitors are not converting. 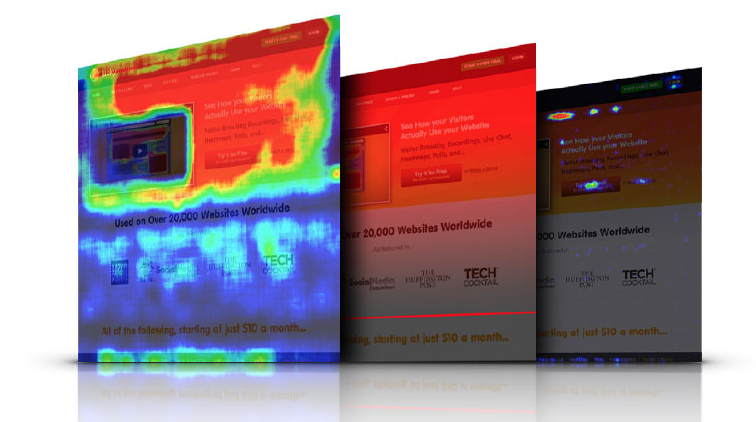 With recording, you can match Heatmaps and get the best visualization of the activities. The recorder provides more useful data like how much time the visitor spent on your site, where he came from, how he navigated your site, which pages he visited, etc. It discover which fields on your forms are causing the most friction and abandonment and so you can correct those. • ABANDONMENT REPORT: This tells where last visited/typed before leaving. 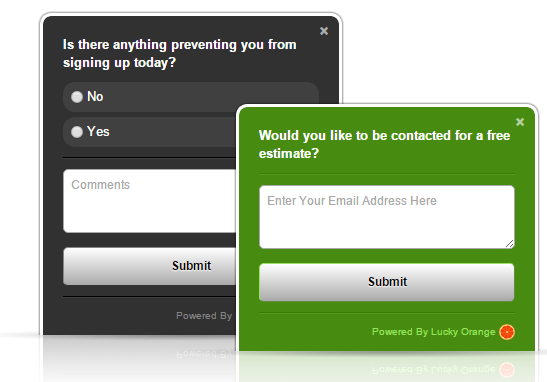 • TIME TO START REPORT: how long it takes on average for visitors to start a form? • TIME TO COMPLETE: You need to know how much time your visitors take to complete each field on your forms. Some fields take more time and may result in high rate of abandonment on average. • REPEAT FIELDS: Which fields are usually repeated by visitors? Customer feedback is very important. If you are a website/blog owner, your visitors are your customers and try to have a feedback. You can build some poles and ask your visitors what they think in the form of radio button or check box or text box answers. If the answer is yes, ask- do you use Wordpress? And based on the answer you can decide whether you should go ahead or not. These polls are fully customizable, can have multiple questions, redirect to URLs, and can be triggered at just the right moment. This is an amazing feature using which you would be able to see each time a new visitor will land to your website. You would be able to see all the details like source of traffic, landed page, demographics details of users and many more. This feature is also linked to the chat system giving you the ability to instantly initiate a chat with a reader that’s currently on a certain page on your site. So if some users are on your pricing page, so you can provide some kind of discount to convert that into sell fast. So using this report, you can work on the points where usually leave you so that in future it will not get repeated. As you seen above, Lucky Orange provides amazing features. With these all features also, their plans are very cheap and one can easily afford it. The starter plan for 1 site just start at $10 per month and for 3 sites, it is $20 per month. You can check the details about the price below. I would suggest you here to go with yearly plan to get extra 10% discounts. How to Install Lucky Orange? Installing Lucky Orange is not a difficult task at all and it will just take few minutes to complete the setup. • Or simply download the Plugin from Wordpress. You can also follow their official guide for installation. This was all about an excellent analytics tool Lucky Orange. They really provide some of the great features to make your online business successful. What you think? Which tool you are using to track your visitor’s activities?